Clear Organic Apple Juice Concentrate (OAJC) is manufactured from clean, sound fruit, which has been washed and sorted prior to processing. The resulting 70° Brix OAJC does not contain any added preservatives, acidity regulators, sugars, colourings or flavours. The OAJC is processed according to good manufacturing practices and complies with the New Zealand Food Hygiene Regulations and the USA Federal Food, Drug and Cosmetic Act. 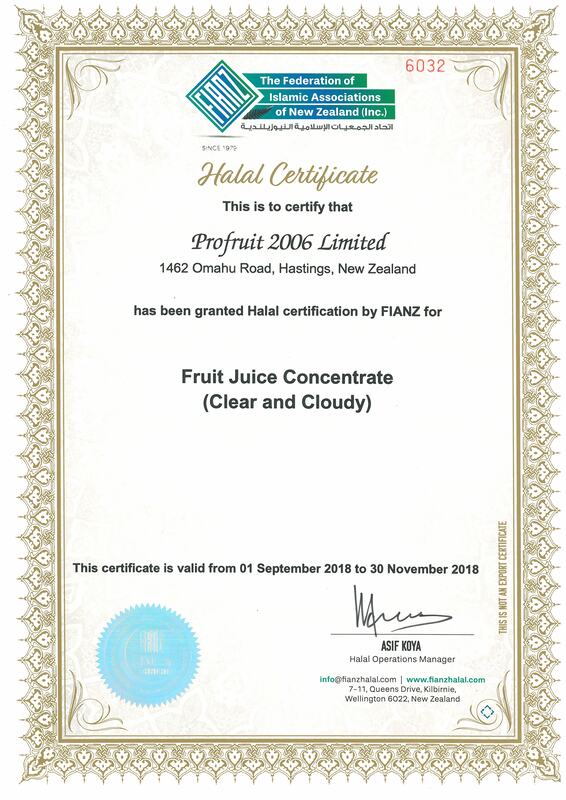 OAJC is produced solely from fruit sourced from the North Island of New Zealand. The OAJC has been processed to preserve, as much as possible, the original quality of the natural fruit. The resulting product, when diluted to single strength, shall be typical of apple; clean and free from burnt, caramelised, fermented or other off flavours. Clear 70° Brix OAJC is available in 200L drums or 1000L crates. Clear 70° Brix OAJC is recommended to be stored in a frozen environment. Clear 70° Brix OAJC has a shelf life of three years, Apple juice however may darken slightly with time, so we recommend that it is used within two years of manufacture. (% w/w malic acid @ 70° Brix) As per customer specification.